← Found a bug or typo in Regency Love? Let us know here! Thank YOU so much! I’m super excited for the update and all the new goodies! I got my letter and handkerchief today! It was a rough morning and it totally made my day. Thank you! The new update, storyline, art, and all, is simply delightful! I dare say I am even more taken with Lord Sutton than Mr.Graham. Perhaps it’s too soon to say, but have you considered the idea of adding him as an additional update to the story? I hope there will be other updates in the future. The protagonist’s mother feels much more like a distinct character with this update ( while still giving the player freedom to define their relationship). It’s so nicely done. I really like all the added scenes with the neigbourhood friends too. I am absolutely loving the update! Graham is wonderful and I’m very intrigued by Lord Sutton. Like others, I’m hoping for a story with him in the future. Thank you for creating this wonderful app and story! I know the update just came out, but are there plans for a separate Lord Sutton storyline? Loved playing through with Graham! Okay first of all wow! I’ve just finished Grahams route and it was absolutely amazing, and claimed place as my favorite route. There was just so much involvement of the other characters and developement of the MC’s mom (I hope we’ll get a route where we’ll actually meet the MC’s brother, or find out what happened). Along with several of the other people here I would also love if there was a route for Lord Sutton at some point. A+ for character design and personality (love the Darcy vibes). I played as a sweet, gentle and sensible MC but every interaction with him brought the witty and competitive sides out of her xD (so much potential for BST). The only thing I would wish (IF he gets a route) is thats its “his own route”, hopefully with a Graham friendship on the side (they are kind of a package deal), and not “just” Grahams route where we need to divert to Sutton. I don’t think I would be able to bear breaking Grahams heart. Thank you so much for your long comment–please don’t apologise for them, because your lovely feedback is what inspires us to continue doing what we do! and I can not find any possible way for this to occur. I would love to support the game, so please, please explain to me how I can do this??? Hi Elle, thanks so much for your lovely comment, and for expressing your wish to support us. We didn’t want to be too “in-your-face” with the option to support us, but if you’ve finished a game and go to your bedroom screen, Lord Fat Cat appears in a bouncing fashion–we decided to “unlock” the supporting option once you’ve played through the game at least once, because we didn’t want to be annoying/demanding/some such, and want everyone to feel comfortable with however much they wish to give. Thanks so much, found it now! Love the update! Although one thing that I was hoping would be added but hasn’t been is an easier way to figure out which responses give you which personality traits. At the moment it’s hard to balance my MC the way I want to because one comment might give her a point in something that’s the complete opposite of her overall character. Another thing that I’d hoped would be fixed is that the game often doesn’t register me tapping on an item (such as an answer to the quizzes or a character icon in the gallery) unless the item is in juuuuust the right place on the screen. Thanks for dropping us a line, Liz! I can understand why you might find it useful to know which options correspond to which personality traits, but unfortunately, we don’t have any plans for making those game mechanics transparent. I know having a balanced MC is an important thing, but we don’t want to take away from the overall immersive experience by putting in the traits underneath each option (some of our beta versions actually had that feature, but we decided to scrap it because it was becoming too distracting). I’m sorry if that comes as a disappointment, but I hope you understand where we’re coming from. As for your other comment, I’ll pass that on to Melody (our developer)–hopefully she can do something about that one! Hello! I’m sorry if this is late for the new update, but I’ve been meaning to say to you three that I truly appreciate the effort you guys put in making such a high quality game! Throughout my various plays, I genuinely felt a deep attachment to each character (like I had known them personally) and it’s really great to see what made a person that person now and how they change when they meet the MC. You can’t help but love them all, though I especially was impressed by Mr. Curtis’s route. No one appears to have any love or appreciation (even outside of the game) for poor Mr. Curtis! He’s seriously such a sweetheart! I do have sort of a question about the donations you could give via Lord Fat Cat. I was kind of wondering when you give your support for the memoirs, is there something to unlock? I kind of see black silhouettes in cases. I was wondering if there was a story, an epilogue of sorts when you give your support for a character or is there just a patron to be put in the character’s honor? Thanks for your comment Cynthia, and I’m sorry it’s taken so long to get back to you. You will receive a little something for your donation, though it’s not exactly “big”–we’ve decided to go for a small token of our appreciation for your support. All right, thank you for answering my question! I look forward to the next update! Hi! I’m a long-time player of Regency Love, and just had to leave a comment on your blog to express my love of this game. I’ve just finished playing Mr Graham for the second time, and have played through Mr Ashcroft and Mr Curtis three times each since I first purchased it; even after knowing the outcomes of the storylines, I can’t seem to stop myself from coming back to it time and time again – my favorite romance game app, no contest. The setting, the music, the drawings, the characters, their storylines – each lovingly crafted element comes together to create an experience that, with each new playthrough, still feels as charming as the first – to me, revisiting Darlington feels just like coming home (possibly because I grew up in a small town now unlike Darlington). The three charming gentlemen — or should I say four? though perhaps Mr Digby’s charm is not as immediately visible to all — are all so uniquely endearing, appealing to all facets of my taste; I honestly cannot choose a favorite among them simply because they each offer something the other doesn’t. By the way, I was thinking on this a while back and wondered if you considered a Kickstarter campaign for the large, expensive updates you may have in future? Not only would this take care of those costs, it would also give greater exposure to the public – every woman deserves to experience this game! I know some people are weird about using Kickstarter to get the money they need, but I honestly think that fans (and future fans) would be only too happy to fund future updates for this game! Thanks for your comment Erica, and I hope you’ll forgive my delayed response. We’re so glad you’ve enjoyed our game so much, and are very grateful you’ve taken the time to express your love for the little world we’ve created. We appreciate your suggestion of a Kickstarter campaign, and we’ve considered it seriously in the past (and there’s even a blog post about it at http://teaforthreestudios.com/2014/06/regency-love-plans-2014-and-beyond/). That being said, there are a few things happening behind-the-scenes at the moment, and although I can’t say much more now, we hope to have a few things finalised and ready to announce in the upcoming weeks. Thank you again for your support–we’re super grateful for it! Hey Samantha I wanted to first say that I love your app. 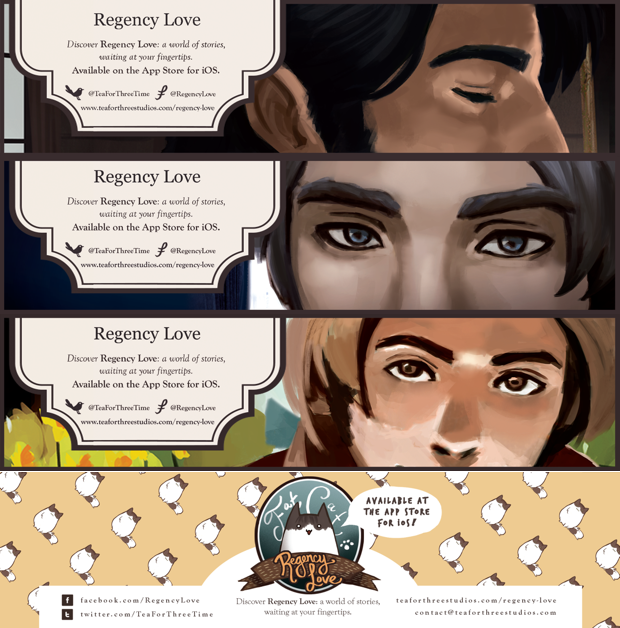 RegencyLove is one of the best romance type games that I have played so far. I did have a question about the achievements. I was wondering if you were going to have a section on your site to give a little description on how to get the achievements? Because I’m trying to get a couple that I don’t understand how to get. One is Mary’s conquest and the other is Dancing with the enemy. Is was wondering if that was possible? I absolutely loved the new update to the game. Mr. Graham’s story was so sweet and nice although I still think my favorite is Mr. Curtis:) I also very much enjoyed the side story of Phoebe and Tom’s relationship. In a hopeful new update I would love there to be a Lord Sutton path and I would also love to learn more about the MC’s brother and what that family situation is like. I love this game! The music, the art, the story… all very well done! I have a question or two, but i’ve submitted them separately. I don’t see how anyone could see Mr. Curtis as dull, as I find his discussion of literature quite enjoyable. He is also the most supportive of my witty quips and feminism! I enjoyed Mr. Ashcroft as well and am quite excited for Mr. Graham’s (and after reading comments, Sutton’s). I was most excited for Phoebe and Tom’s development, ever since their introduction. I look forward to further improvements and updates! I love this game! It’s so adorable and well made. I’ve been playing from the start and just purchased Mr Graham’s route. But help! I seem to be stuck! I have tried over new 3 times now but I can’t seem to get past the park scene where MC and Graham see Suttin and Miss snotty lady together. I get through the scene and nothing new shows up. I have tried discouraging the other men, ignoring their routes as much as possible, being mean to Digby… Any advice? Please add a Sutton path. It totally hit the feels. Replaying after 2 years. Can we have a Sutton path now? ?